Sometimes, a little distance is all you need to see things in a brand new way. 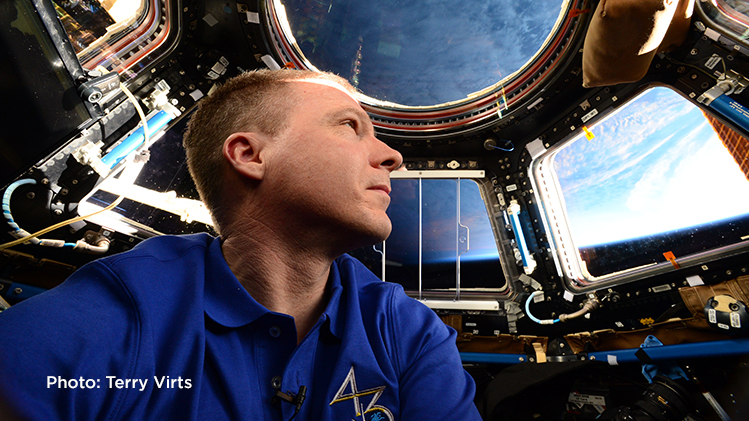 For astronaut Terry Virts, his newfound perspective was from the International Space Station (ISS), where he installed the Cupola module, granting an unprecedented 360-degree view from the station. When he later became the commander of the ISS, he made good use of the Cupola, taking more photographs than any astronaut who came before him. Many of those images were later used in the National Geographic book View From Above and IMAX film A Beautiful Planet, but to hear Virts tell it, no photo can capture the perfect shade of blue from a sunrise viewed from outer space. Attending all three National Geographic Live shows? Purchase a Nat Geo Live package: all three shows for $85. Buying three or more shows in our 2017-2018 season? Save up to 15% with a Design Your Own package! Click here to fill out a reservation request form for your school for the 10am performance.